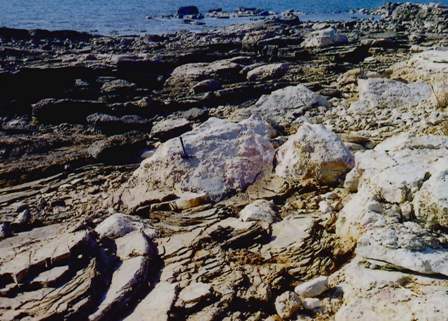 The Middle Eocene clastic sliccess ion in the Radovin Syncline isapproximate ly 900 m thick and consists of hemipelag ic and nyschtypedepos its in its lower part, and shallow-marine sediments in itsupper portio n. The upper portion embraces a unit of sandstones andconglomerates, which is represented by several facies. Flat- and lowanglelaminated. and hummocky cross-stratified sandstones (S 1) ori ginatedby storm-re lated processes in the sho re face. Cross-beddedsandstones (S2) reflect longshore. offshore. and onshore nows also inshoreface settings. Flat -laminated sandstones with planar truncations(S3) reflect swash processes. Some sandstones possibly originated inthe offshore transition zone. Conglomerate- sandstone co upl ets (CS)originmed by storm-induced flows in the shoreface. Main conglomerates(CM) mostly reflect various processes and modifications performedin upper shore face and beachface sett ings of a refl ectivecoas t. Most Cross- bedded conglomerates (CX) reflect longshoreflows lind di ssi pative conditions. There arc also conglomerates whichhave poss ibly been deposited by gravity fl ows re lated to river flood s.The shoreline was ori ented NW - SE.The architecture of the sandstone-conglomerate unit is thought tores ult from the interfingering of deltas and nears hore sandy sys tems.Deltas were of the shelf- type, and were predominantly "wave-domi nated".The sed iments studied reflect molasse-type deposition, whichwas induced by early post- fl ysch changes in basin evolution and thepalaeogeography of the Palaeogene clastic basin in the coastal Dinarides. Authors have copyright and publishing rights on all published manuscripts.